Lech Majewski’s The Mill and the Cross, currently playing at Film Forum, is what would normally be called a tableau vivant—a painting brought to life. Actually it’s art history come to life, as Majewski not only wrote the haunting music for the film, but also co-authored the screenplay with the art historian Michael Francis Gibson. The subject of the film is Pieter Brueghel the Elder's 1564 painting The Road to Calvary, which today hangs next to The Tower of Babel in Vienna’s Kunsthistorisches Museum, and in one sense the film simply presents the backstory of the painting. The depredations of the Spanish occupiers of Flanders, which included burying infidels alive and crucifying them, are the centerpiece of The Mill and the Cross. But there is also the human comedy, or carnival, manifested in the ubiquitous macabre depictions of both human sexuality and sadistic children’s play. Ironically, the most haunting moment is the final shot in which we see the Brueghel painting behind a rope in the museum as the camera pulls away from it in a long shot. All along we had been brought into the center of the artwork, and now the painting is consigned to being simply an object photographed at a distance in a famous art museum five centuries later. 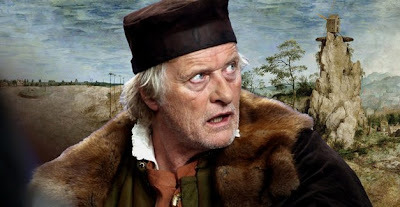 Even more jarring are the presences of Michael York, Charlotte Rampling and Rutger Hauer, who plays Brueghel. These aging cinematic icons break the silence that introduces the movie, but to what end this parade of acting royalty? Kirk Douglas played the tortured Van Gogh in Lust for Life, but Majewski’s subtlties are muddled by the display of star power.